Cajun-spiced, fried, dried, wrapped in rice; we’ve all got the same, or similar, seafood to work with, but every culture has their own spin on it. So hop on a flight and the leave your local catch-and-fry behind. Here are the must-visit destinations all seafood lovers should visit. Opened in 1935, the Tsukiji Fish Market is the largest wholesale fish market in the world, and home to over 480 different kinds of seafood. The most popular attraction is the tuna auction, where one Bluefin can sell for upwards of $10,000. The current record is $1.8 million. Tourists line up as early as 3 a.m. to be among the first 120 visitors allowed to witness the magic happen. The outer market consists of retail shops, restaurants, and food stands with fresh seafood cooked in front of you. The popular choices here are seared tuna skewers, grilled eel, and seafood platter over clam shells. For unbeatable sushi, get to Sushi Dai, where people line up as early as 4 a.m. for a unique omakase (chef’s choice) experience. Looking for variety? As a coastal city, Durban has a wide range of shellfish and fish to offer. For one-of-a-kind dining, The Cargo Hold is located inside an old ship where diners enjoy fresh seafood next to a shark aquarium. If you want to fully immerse yourself, fishing for your meal is the way to go! White Stumpnose, Cape Salmon, Bronze Bream, and Spotted Grunter are common catches. In 2016, Maine fishermen set a record, raking in over 130 million pounds of lobster. Some of that was due to the high demand from China, which purchases nearly $27.5 million of live lobster in one year. For an authentic waterside experience, the Portland Lobster Company serves solid lobster rolls with live music. Jake’s Famous Crawfish is another local favorite. You can’t go wrong with anything on their menu, but the Dungeness crab cakes and chilled spiced crawfish are clear favorites. If you’re looking to get more bang for your buck, hit up Olympia Oyster Bar for their famous oyster happy hour. Su-Tu-Kil on Cebu island is filled with seafood stalls. It’s also an acronym for three popular ways to cook seafood in the Philippines: “Sugba” (grilled), “Tuwa” (soup), and “Kilaw” (cured in vinegar). Unlike your typical marine meal, you buy the seafood there and bring it to a nearby restaurant where they cook it for you. If you prefer to come empty-handed and ready to feast, restaurants like Lantaw are just as fresh. Filipino-style grilled squid (inihaw na pusit), shrimp in tamarind soup (sinigang na hipon), and raw fish salad (kinilaw na isda) are delicious dishes to start with. Home to some of the most sustainable shellfish and salmon farming initiatives in the world, British Columbia produced about $497 million in farmed seafood products in 2015. A quintessential seaside treat, fish and chips don’t get much fresher than those sold at Go Fish by the Fisherman’s Wharf. Every morning, this spot purchases fresh fish from commercial boats and closes the shack when they run out of ingredients for the day. You can choose from a selection of cod, halibut, or salmon. Vancouverites also love sushi. Miku is a popular spot with a spectacular view. With over 1,000 miles of coastline, Galicia is home to some of the best seafood in the world. Known for using fresh ingredients, Marisqueria Rios is the perfect place to sample a wide range of seafood. Though expensive, most visitors order a mariscada (seafood platter) to get a taste of the local pickings. If you want to be pleasantly surprised, ask the fishermen where to eat. Be sure to try a Galician favorite, the pulpo a la feria, tender grilled octopus sprinkled with paprika. Mercado de Mariscos is famous for fresh seafood at fantastic prices. Many visitors buy their seafood here and take it upstairs to restaurants that cook it any way you like. But keep in mind that market competition is high and sellers will lie about how fresh their products are to close a deal. While picking your fish, make sure their eyes are clear (not cloudy) and the meat is firm. Don’t leave Panama until you try the ceviche, raw fish doused in lemon or lime juice with onions and spices. Louisiana is the nation’s second-largest seafood supplier; one out of 70 jobs is related to the seafood industry. One of the best spots to sample some of Louisiana’s finest seafood is Red Fish Grill where the menu includes oysters, alligator, seafood gumbo, and crawfish. Among the many Cajun-style restaurants throughout New Orleans, Cajun Seafood stands out for serving crawfishes so pungent that the smell takes over the whole block. Whole-fish grilled style redfish from Peche has also been creating quite a buzz. You can’t go wrong with any of the restaurants in Lei Yue Mun Market (meaning “carp channel”), but the best spots are usually crowded. Gateway Cuisine has one of the better views of the harbor. Along with fresh fish, dried seafood is one of Hong Kong’s oldest industries. Dried abalone, salted fish, and dried mussels are delicacies in Chinese culture. If the world is your oyster, then Galway is your next destination! The International Oyster & Seafood Festival started in 1954 and is now the oldest oyster festival in the world. About 22,000 attendees come from around the world each year to enjoy live entertainment, fine wine, and of course, an oyster feast. The four-day event even hosts a shucking competition, where competitors are given 30 oysters to open as quickly as possible. We suggest bringing heavy gloves if you plan on competing. Tasmania produces more seafood than any other state in Australia, and 25 percent of the world’s wild abalone. A typical Tasmanian seafood platter includes salmon, rock lobster, abalone, oysters, scallops, octopus, and squid. The Tasmanian Seafood Seduction cruise is the ultimate immersive experience for seafood lovers as local guides bring visitors straight to the source. 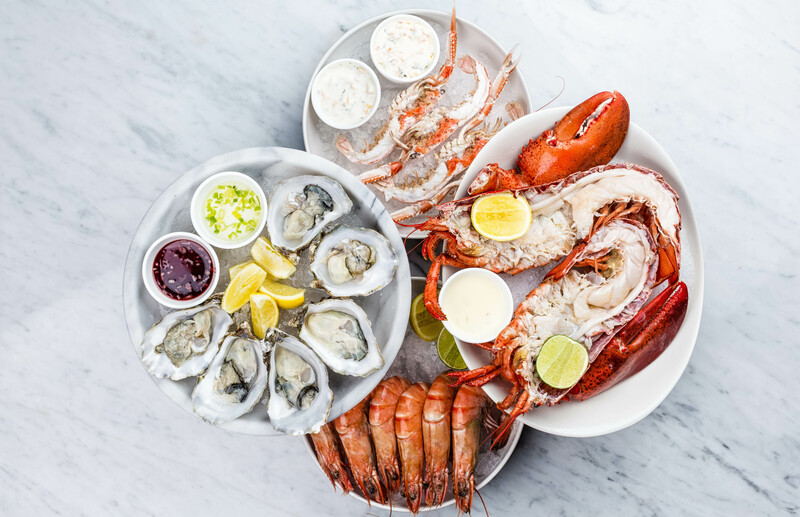 The deck at Hallam’s Waterfront Seafood is a perfect spot to sample Tasmanian staples like slow-cooked abalone, freshly shucked Pacific oysters, and pan fried Atlantic salmon. Pair your seafood trip with our wine or beer pilgrimages to complete your epicurean journey.